Was finally done with the Tupelo Market before driving down to Columbia (not the South American country) to visit a client. It was a charming little town that played a significant role during America's Civil War. I was at my client's factory and it has lost the bustle of activity as the current management has switched over their business more and more towards importing rather that manufacturing. 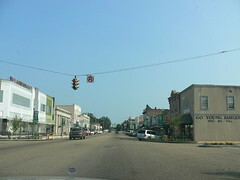 Gone are the hey days of the 1950s where it was moved from Louisiana to Mississippi. Owing to growing competition to foreign imports, manufacturing as become more and more difficult to carry on due to their higher labour cost. As I stepped into their factory floor, I was mobbed by curious stares from the workers and I wondered if they are staring because I am Ch1nese or if they knew I was there to take away their jobs with my cheaper exports? 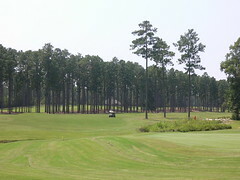 That appointment lasted 2 hours before officially calling my business trip over as I head over to Timburton Golf Club in Hattiesburg for a round of golf to officially kick off my R&R. 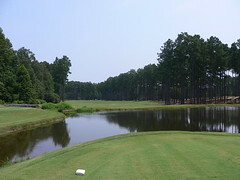 The golf course was beautiful and very very well maintained. Those tree lined neatly in a row, are pine trees. I asked my host how did they make it such that all the trees lined up to be the same height. My host replied, "They planted all the trees at the same time." Brilliant answer for a damn stupid question. Ouch. After golf, we drove further down South out of Mississippi and into Louisiana or more specifically, New Orleans. Finally, a decent hotel after spending a week in motels. 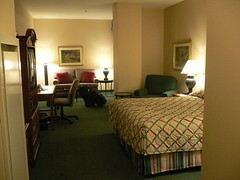 The Hilton Garden Inn was a pleasant surprised as I was given a mega huge-assed room. The irony was that at USD 60.00 a night, it was even cheaper than the motels that I stayed in Tupelo and Columbia. Unlike Tupelo, the towels here do not have yellow patches that felt quite stiff in your hands. Sheesh. Ahh... finally, I good night's rest. But before we hit the hay, we headed over the Deanie's for a seafood dinner. We had crawfish, catfish, oyster and crab, all deep fried. I think I not only ate enough seafood to last me my year's intake of iodine, but also enough oil from the deep fryer to make sure Singapore gets their petrol prices back to under SGD 1.00 (if the gahmen can help it,that is). 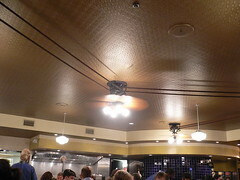 The interior decor of Deanie's reminded me very much of our Seah Street Deli and their ceiling fan is very interesting. 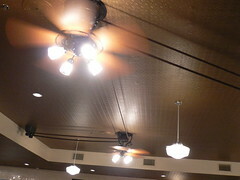 Only a single motor to power all 5 ceiling fans by way of interconnecting fan belts. After dinner, we felt so guilty with the binge that we decided to walk it off by taking a stroll along the famous Bourbon Street. As it was a Monday night, it wasn't too happening, unfortunately. Bourbon Street is located in the heart of the French Quarter and it was no surprise to see the influence of the French on their architecture. 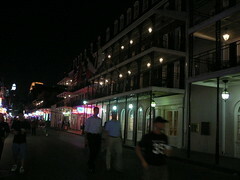 The area was named French Quarter is it used to be a French settlement in the early days of the 1800s. Another interesting trivia was that New Orleans was also at one time ruled by Spain for 40 years, when they succeeded the French before handing back to the French again. All these before New Orleans was finally sold to the Americans and USA declared their independence thereafter. Goto my flickr account if you are interested to see these pictures in larger size. Beautiful pictures! =) And yes...hahaha i would have asked the "stupid" qn if i was in your shoes too. Enjoy the rest of your stay at this exotic place! Lynne: Big easy indeed. Very much like Mohd Sultan except that the bands are much much better. As the wind blew, you can smell the dried puke, piss and crap in the air. I guess it is part and parcel of Bourbon Street. 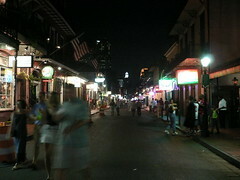 Ironically, Bourbon is Tennessee whiskey and yet this street is in the heart of New Orleans, Louisiana. CrunchyGreenApple: Yeah. Thanks. It was a beautiful place. Seafood was very good also but I still think our seafood more shiok. Akk: Yah boy... I expected the small as the motels given that the room rates were similar. Have to say that I was pleasantly surprised.